Nose is delicate sensory organ which provides you with some of the greatest pleasures. Most importantly it is designed to warn and protect the body against dangers. 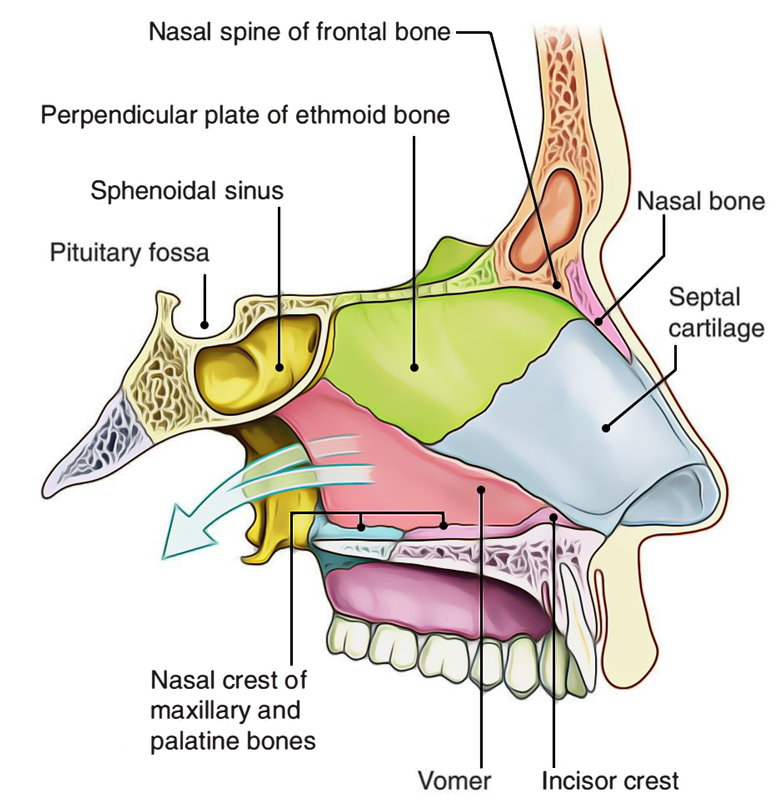 The inside of the nose (also termed internal nose) is split into left and right nasal cavities by a nasal septum. 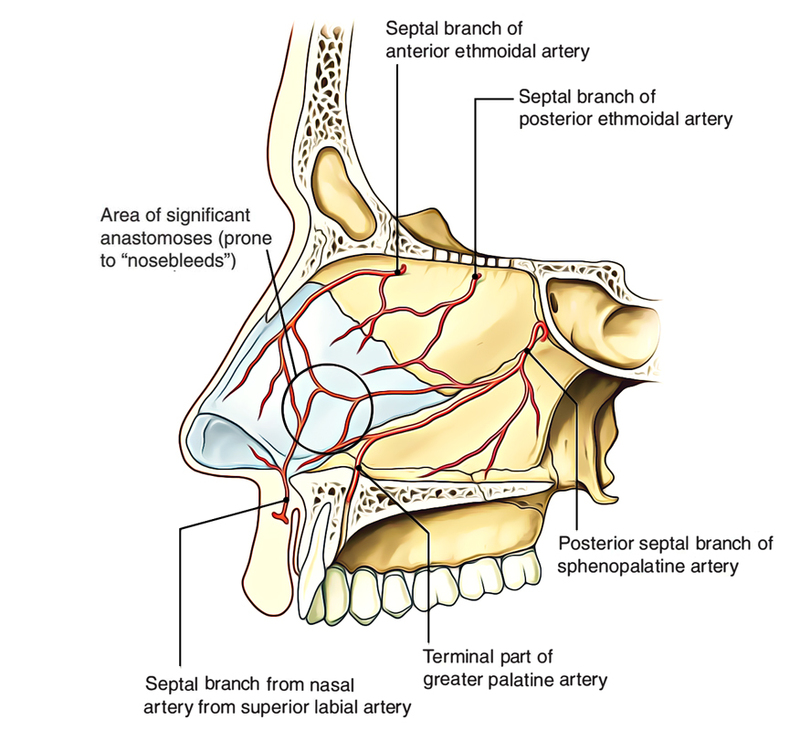 Every nasal cavity interacts with the outside via nostril (or naris) and together with the nasopharynx via the posterior nasal aperture (or the choana) every nasal cavity is split into 2 portions: (a) a small anteroinferior part lined by skin-the vestibule and (b) a large posterosuperior part lined by mucosa-the nasal cavity appropriate. It’s the anteroinferior part of nasal cavity, lined by skin. The skin includes sebaceous glands, hair follicles and the stiff interlacing hair termed vibrissae. 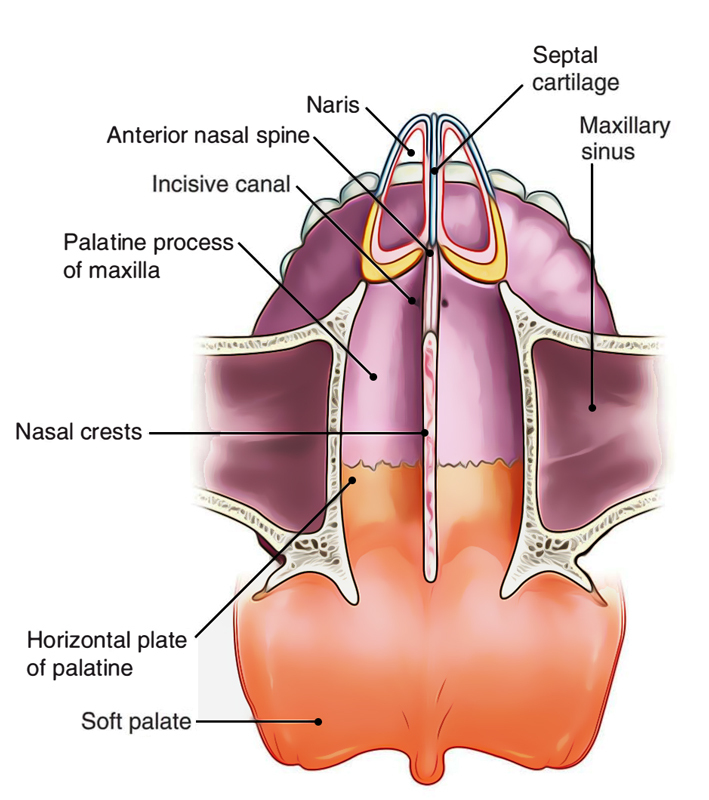 Its upper limit on the lateral wall of nasal cavity is marked by limen nasi. Its medial wall is composed by a mobile columella. The roof is extremely narrow in front and widens to about 1 cm near the choanae. It’s horizontal in the middle third, where it’s created by the cribriform plate of the ethmoid. 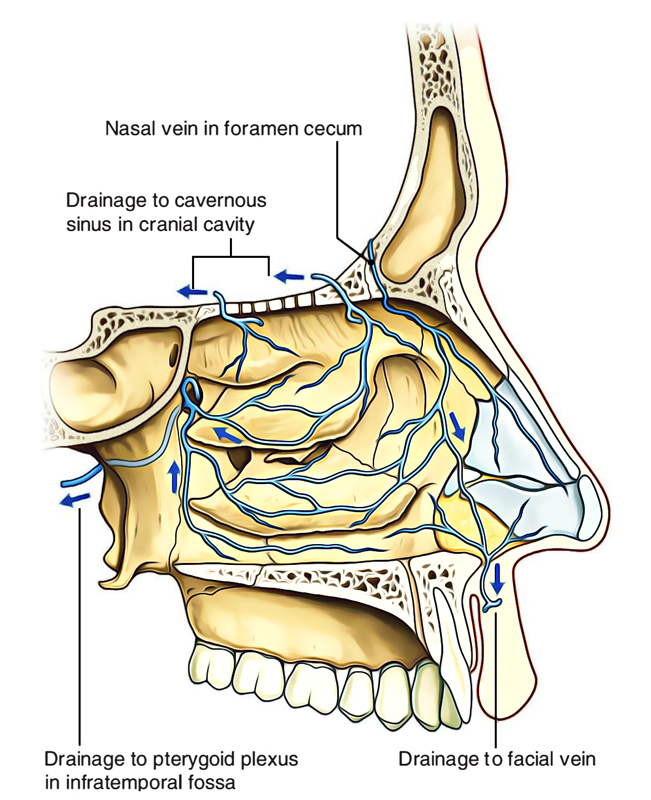 Via this olfactory nerves goes into the cranial cavity from the nasal cavity. The anterior third of roof inclines downwards and forwards. It’s created by the nasal spine of the frontal, the nasal bone and the junction of the septal and lateral cartilages. The posterior third of the roof also slopes downwards and backwards. It’s created by the anterior surfaces of the body of the sphenoid. The floor is virtually horizontal. It’s created by the upper surface of the hard palate, i.e., anterior three-fourth is composed by palatine process of maxilla and posterior 1 fourth is composed by the horizontal plate of the palatine bone. 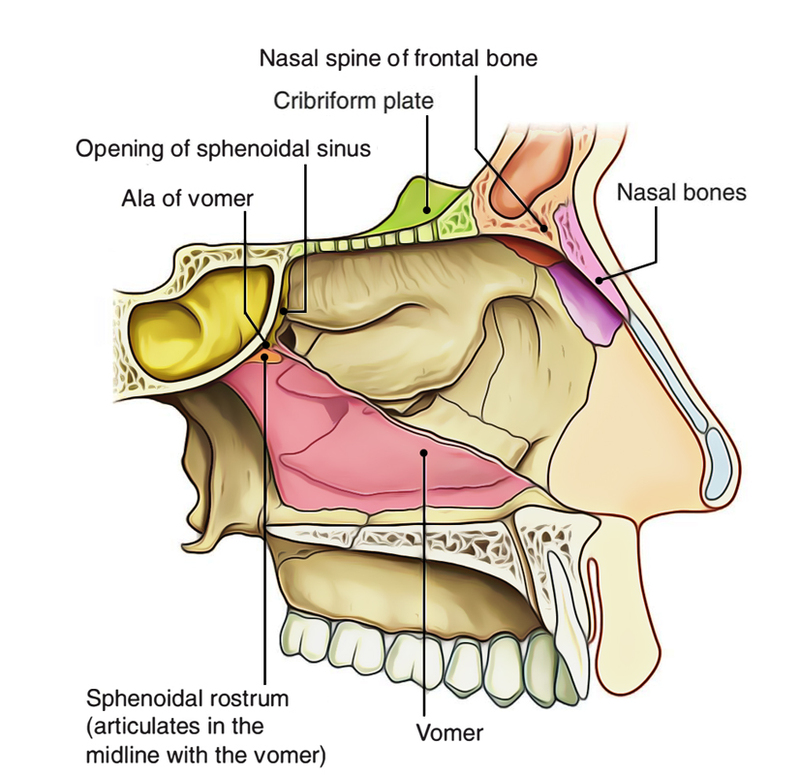 Vomer, which creates the posteroinferior part of the septum. 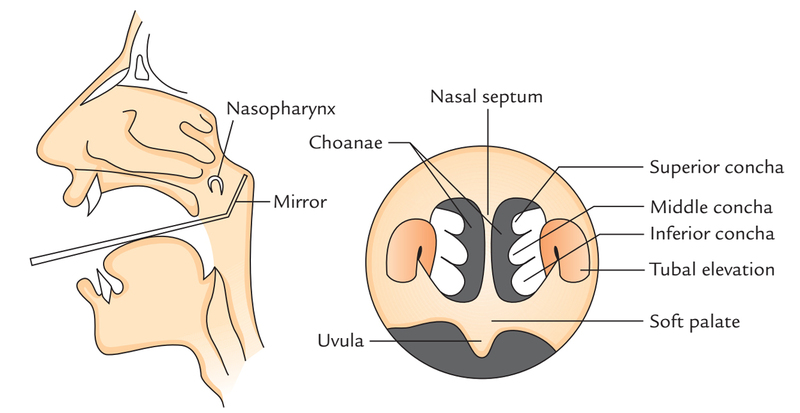 Moreover, the nasal spine of fontal bone, crest created by nasal bones, sphenoidal crest and nasal crest created by the fusion of palatine processes of maxillae and horizontal plates of palatine bones also give somewhat in the formation of nasal septum. Septal cartilage, which creates the major anterior part of the septum and fits in the angle between the vomer and perpendicular plate of ethmoid. Septal processes of both major alar cartilages. The septal processes (medial crura) of 2 major alar cartilages are combined together in the midline by a fibrous tissue to create columella (also referred to as columellarseptum). Between the columella and caudal border of the septal cartilage, a small portion of septum is created from double layer of the skin with no bony or cartilaginous support. This part is called membranous septum. Both columellar and membranous parts are freely movable from side to side. Deviated Nasal Septum (DNS): The deviated nasal septum isn’t unusual and is an essential cause of nasal obstruction. The males are affected more than females. It takes place because of numerous variables like trauma, developmental blunder, etc. If DNS is acute and causing mechanical obstruction, resulting in trouble in breathing sinusitis, headache, excessive snoring, etc., it’s corrected by submucous resection (SMR) or septoplasty. The septal cartilage not only creates partition between the left and right nasal cavities but also gives support to the dorsum of the anterior two-third of the nose. For that reason, its destruction as a result of disease or excessive removal in submucous resection leads to supratip depression of the external nose. 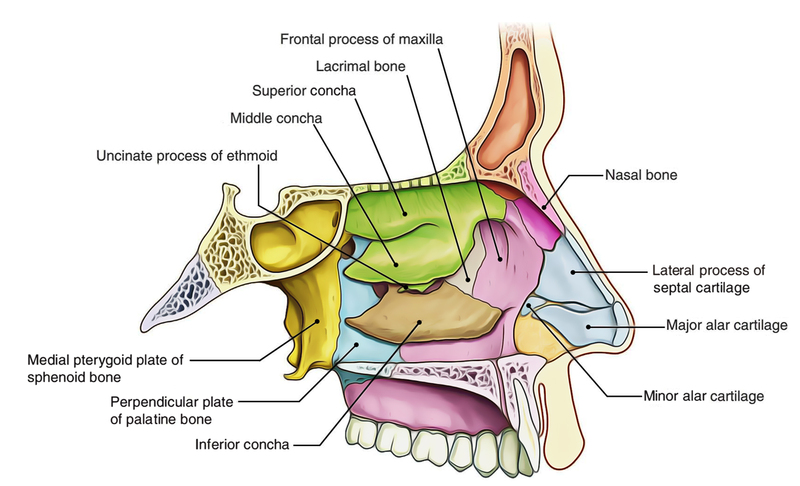 The lateral wall of the nose is complicated. It’s created by a number of bones and cartilages. Anterior part presents a small depressed area, the vestibule. It’s lined by the skin including vibrissae (short, stiff curved hair). Middle part is called atrium of the middle meatus. Itis restricted above by a faint ridge of mucous membrane, the agger nasi. The curved mucocutaneous junction between the atrium and vestibule is called limen nasi. Posterior part presents 3 scroll-like projections, the conchae or turbinates. The spaces dividing the conchae are referred to as meatuses. Conchae (also named turbinates) are the curved bony projections pointed downwards and medially. Below and lateral to every concha is a corresponding meatus. From above downwards the conchae are superior, middle and inferior nasal conchae. Occasionally a 4th concha, the concha suprema is also present. Superior and middle nasal conchae are the projections from the medial surface of the ethmoidal labyrinth. Inferior concha is a separate bone. 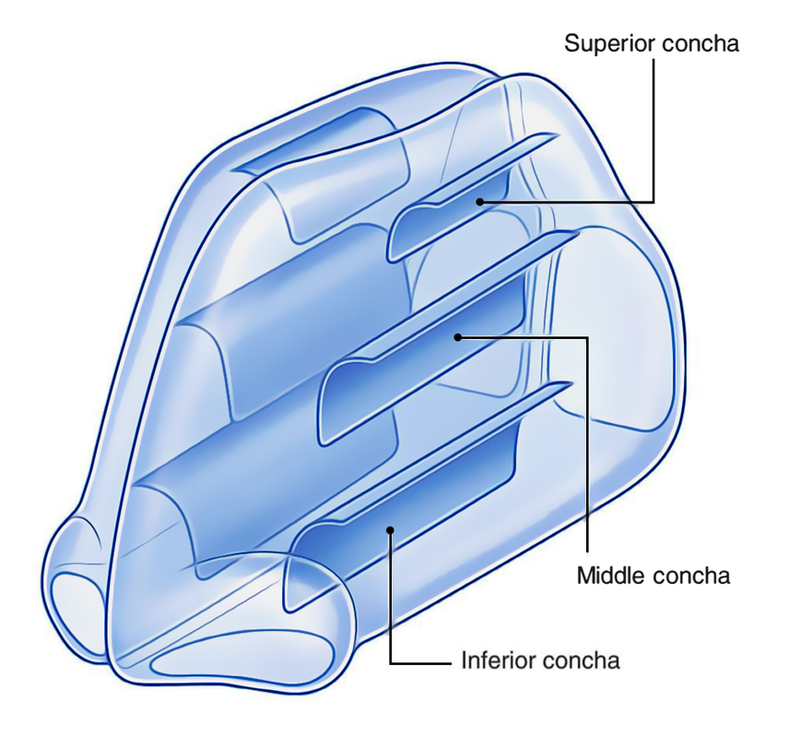 The superior concha is smallest and inferior concha is largest in size. Meatuses are the passages (recesses) below the overhanging conchae. They’re visualized once conchae are removed. Inferior meatus is the largest and is located underneath the inferior nasal concha. Ethmoidal bulla (bulla ethmoidalis), a round elevation generated by the underlying middle ethmoidal sinuses. Hiatus semilunaris, a deep semicircular sulcus below the bulla ethmoidalis. Infundibulum, a short passage in the anterior end of middle meatus. Superior meatus is the smallest and is located below the superior concha. A triangular depression, above and behind the superior concha is called the sphenoethmoidal recess. 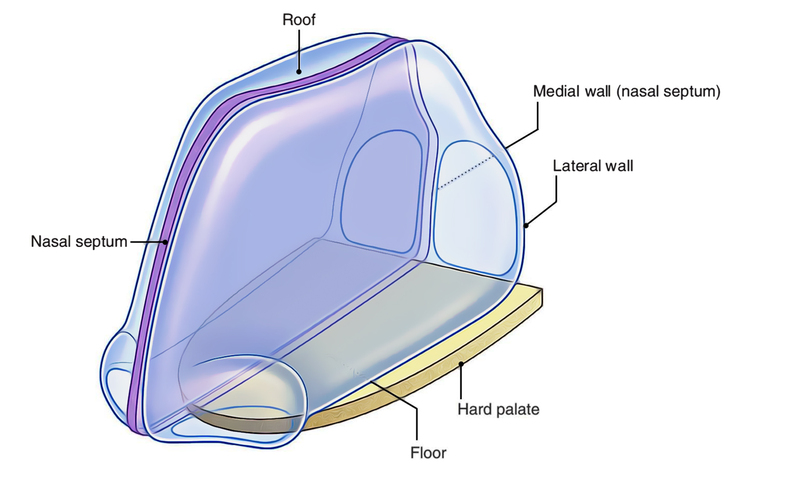 Openings: The lateral wall of the nose has number of openings. The openings in the lateral wall of the nose. Vestibule: It’s lined by the skin comprising a large number of sebaceous glands and interlacing rough hair-the vibrissae. As the air goes through the nostrils the large particles of dust in the air are trapped by the vibrissae. 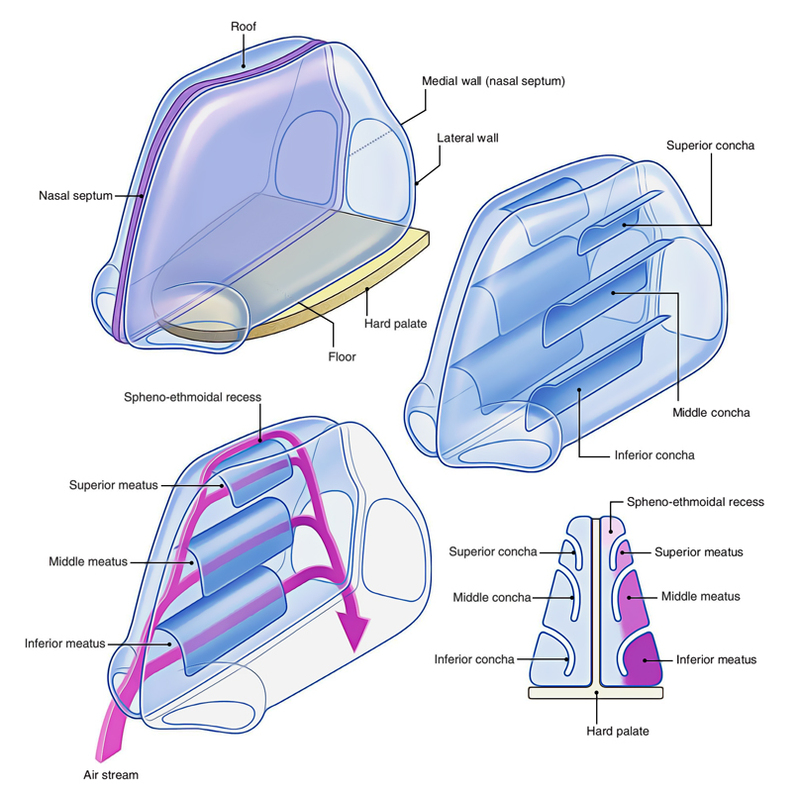 Olfactory region: The upper third of the nasal cavity bounded above by cribriform plate of ethmoid, laterally by superior nasal concha and medially by upper one-third of the nasal septum creates the olfactory region. It’s lined by the olfactory epithelium, which includes receptor cells for scent. Here mucous mem-brane is lighter in color. 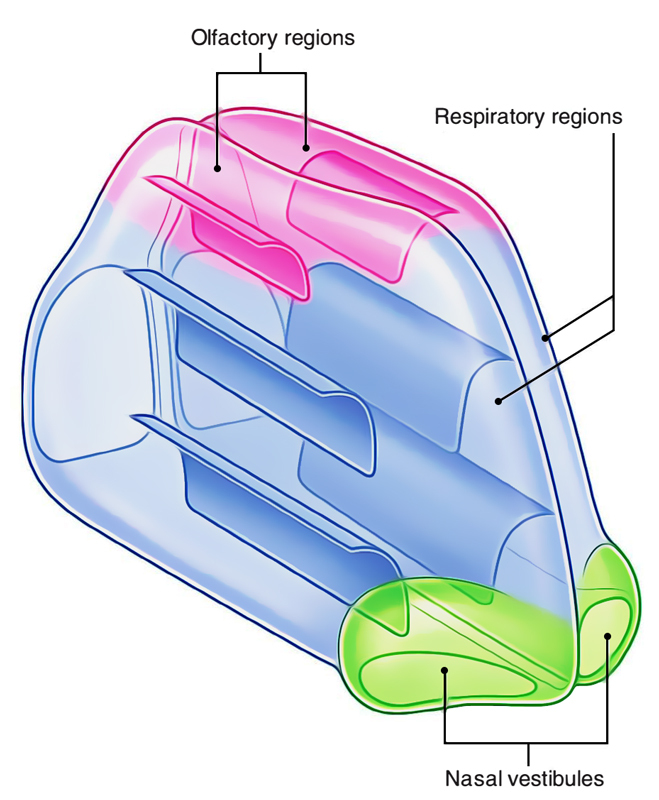 Respiratory region: The remainder of the nasal cavity (lower two-third) is lined by the respiratory epithelium, i.e., pseudostratified ciliated columnar epithelium with goblet cells. The respiratory mucosa is extremely vascular and includes a large number of cavernous spaces and sinusoids to warm the air. Moreover, it includes a large number of serous and mucous glands. The secretion of the serous glands makes the air damp while the secretion of the mucous glands traps the dust and other particles. Farther, the cilia on the top layer of the mucous membrane sweep the mucous posteriorly into the pharynx where it’s consumed and removed by the GIT. Because of the presence of cilia in the epithelial lining and secretions of the serous and mucous glands in the nasal cavity, the air while going through the nasal cavity isn’t only filtered but also moistened and humidified, a mechanism that shields the lower respiratory tract. The nasal cavity has abundant arterial supply. Septal branch of the anterior ethmoidal artery (a branch of ophthalmic artery). Septal branch of the posterior ethmoidal artery (a branch of ophthalmic artery). Septal branch of the sphenopalatine artery (a branch of maxillary artery). Septal branch of the greater palatine artery (a branch of maxillary artery). Septal branch of the superior labial artery (a branch of facial artery). It’s an area in the anteroinferior part of the nasal septum just above the vestibule. It’s highly vascular. Here the septal branches of the anterior ethmoidal sphenopalatine, greater palatine and superior labial arteries anastomose to create a vascular plexus referred to as Kiesselbach’s plexus. This area of nasal septum is the commonest site of epistaxis (nose bleeding) in kids and young adults generally because of finger nail trauma following deciding of the nose. Anterosuperior quadrant, by the anterior ethmoidal artery, a branch of ophthalmic artery. Anteroinferior quadrant, by branches of facial and greater palatine arteries. Posterosuperior quadrant, by sphenopalatine artery, a branch of maxillary artery. 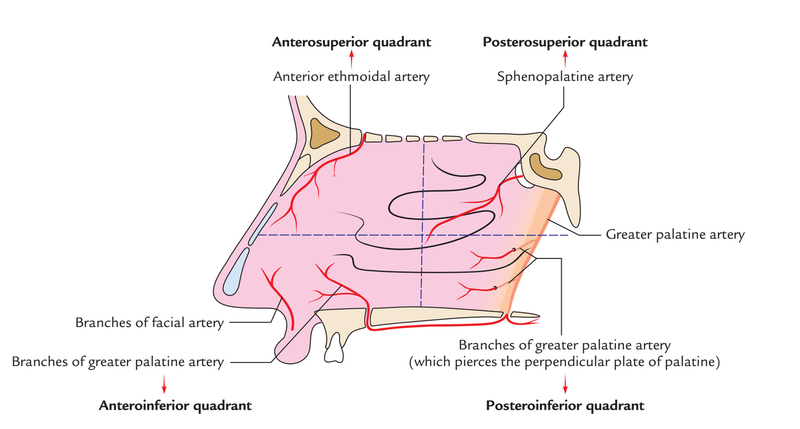 Posteroinferior quadrant, by branches of greater palatine artery, which pierces the perpendicular plate of palatine. The veins draining the nasal cavity create plexus below the mucosa and in general follow the arteries. The veins of nasal cavity drain into facial vein, pterygoid venous plexus and pharyngeal venous plexus. The submucous venous plexus is more marked in the region of little’s area. 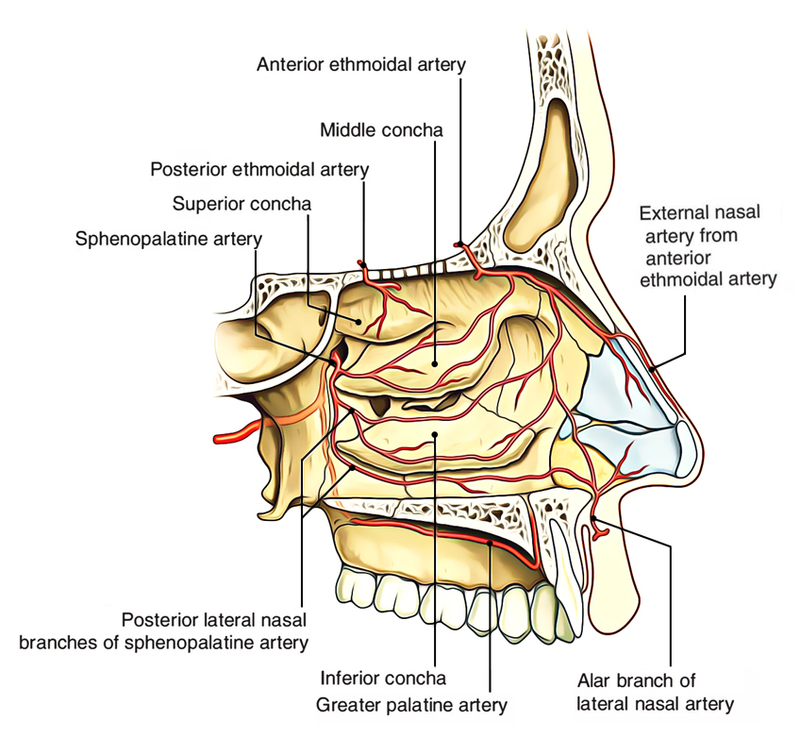 The retrocolumellar vein runs vertically downwards, crosses the floor of nasal cavity to join the venous plexus on the lateral wall. This is the common site of venous bleeding in young people. 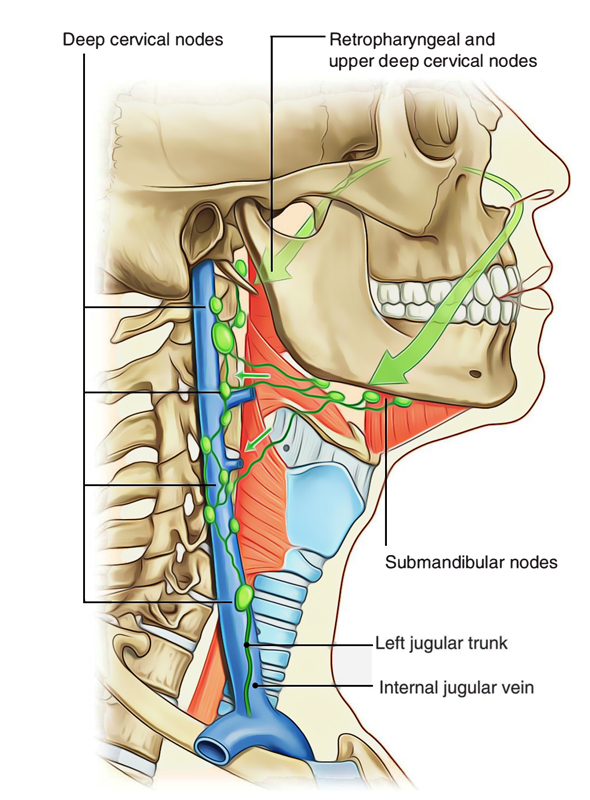 Lymph from anterior half of nasal cavity (both medial and lateral walls) is emptied into submandibular lymph nodes and from posterior half into retropharyngeal lymph nodes. 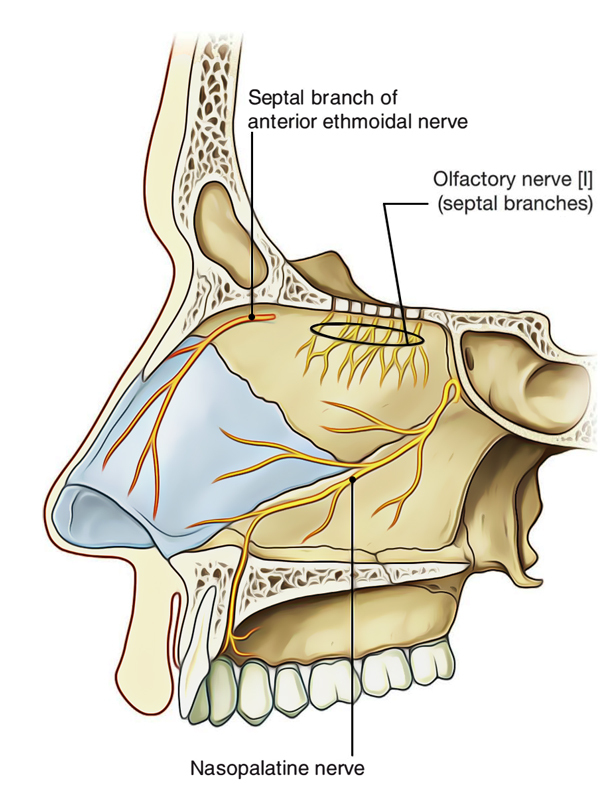 Olfactory nerves: They carry sense of smell from olfactory region of nasal cavity. They carry sensations of pain, feel and temperature from respiratory region and vestibule of nasal cavity. Autonomic nerves: Both parasympathetic andsympathetic fibres furnishing nasal cavity are originated from Vidian’s nerve (nerve of pterygoid canal) via pterygopalatine ganglion. The parasympathetic fibres supply nasal glands and restrain nasal secretion. The sympathetic fibres, on stimulation, cause vasoconstriction. It’s the inflammation of mucus membrane lining the nasal cavity. The hypertrophy of mucosa over inferior concha is a familiar characteristic of allergic rhinitis. Medically it presents as: nasal blockage, sneezing and water discharge from nose (rhinorrhea). The excessive rhinorrhea on account of vasomotor and allergic rhinitis can be restrained by sectioning the Vidian nerve. 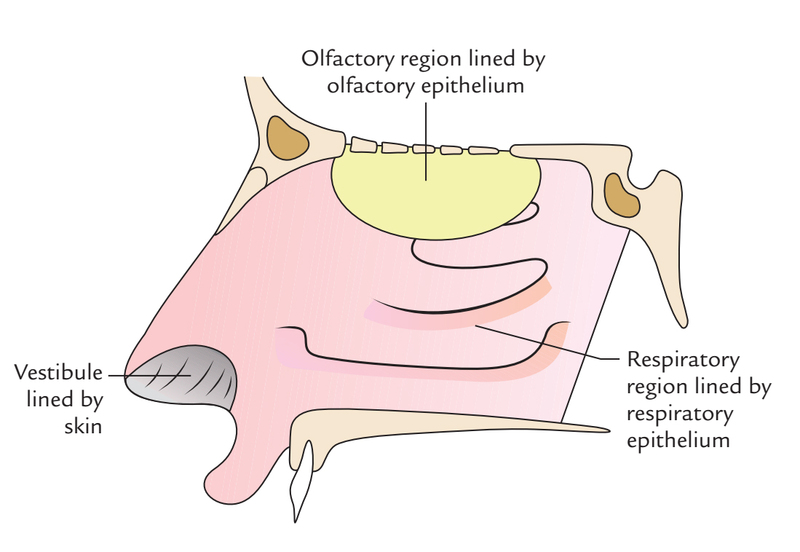 Olfactory nerves-supply the upper part (one-third) just below the cribriform plate. Internal nasal branch of the anterior ethmoidal nerve, a branch from nasociliary-supplies the anterosuperior part. Nasopalatine nerve, a branch of pterygopalatine ganglion-supplies the posteroinferior part. Medial posterior superior nasal branches of pterygopalatine ganglion-supply the posterosuperior part. 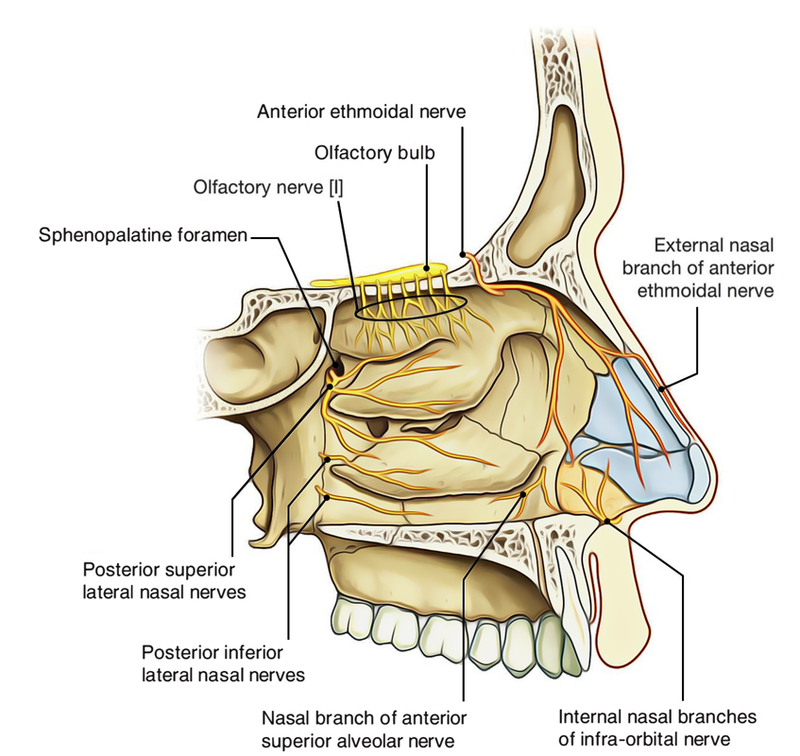 Nasal branch of greater palatine nerve-supplies the posterior part. Anterior superior alveolar nerve, a branch of maxillary nerve-supplies the anteroinferior part. Olfactory nerves-supply the upper part (one-third) just below the cribriform plate of ethmoid up to the superior concha. Anterior ethmoidal nerve (from ophthalmic)-supplies the anterosuperior quadrant. Anterior superior alveolar nerve, a branch of infraorbital nerve (from maxillary)-supplies the anteroinferior quadrant. Posterior superior lateral branches, of pterygopalatine ganglion-supply posterosuperior quadrant. Nasal branches of greater palatine nerve, (from pterygopalatine ganglion)-supply posteroinferior quadrant. The nasal cavity can be analyzed in the living individual either via the nostril (anterior rhinoscopy) or via the pharynx (posterior rhinoscopy). Superior middle and inferior meatuses. Floor of the nasal cavity. Posterior border of the nasal septum.